We deliver the ACWE using the same delivery model as the CAVA. This involves all of the theory being delivered through our Virtual Learning Environment, then you would be required to attend a session at your closest centre to cover the assessments with the two learners. At Brooks and Kirk, we don’t have set start and end dates. This means that you can get started as soon as you are ready and the duration of your course is entirely down to you. Brooks and Kirk have come a long way since Pat Brooks and Joan Kirk founded the company over 20 years ago, but one thing has never changed… This is that we will always go above and beyond to ensure that our learners receive the high quality training that we promise. We would provide you with an array of learning resources that can be made available both online and offline. Furthermore, even though the vast majority of this assessor course is delivered online, your assessor is only ever a phone call or email away. If you would like to find out more about what our learners say about our course and their supportive tutors, please have a look at our Learners Reviews page. 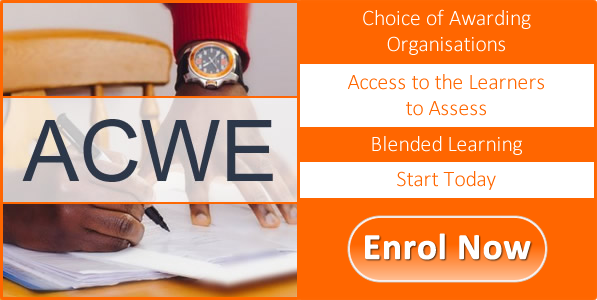 Because we provide access to the learners to assess as part of the course, you don’t need to be working in a relevant job role to complete your ACWE. If you just want to get the course paid off in one go, then you can pay in full and save £50! Pay your course fee in full and start within one working day. With our incredibly flexible instalments option, you get to set up your own personalised direct debit. Pay your registration fee and start within one working day. Have a read of our ‘Why Us‘ page to find out more! Just looking at getting started? Or, do you still have a few more questions? If so, then please fill in our enquiry form below and we will be in touch within one working day. Alternatively, if you would like to speak to someone ASAP, then you can just give us a call on 01205 805 155. Is there a specific time that would be best to contact you?